I used this recipe as inspiration - I added the solid ingredients to ground pork to make meatballs, then used the dressing as a dipping sauce. The result was very tasty. I really liked the sauce as well, but my husband preferred the meatballs without sauce. I really liked the combination of flavors here, but the children (10) did not. I did not think heating the oil and then pouring it over the salad would wilt the salad enough, so I stir-fried the spinach (with the onion and garlic) for a few minutes, then added the other ingredients. This worked well. Subbed baby kale for watercress and used only fresh mushrooms. Simple stirfry - good with rice. 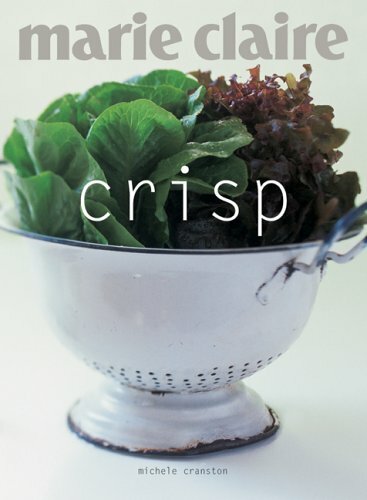 Crisp will tempt your taste buds repeatedly with its terrific recipes and stunning photography. This cookbook bursts with an overarching theme of color and flavor. The full spectrum of tastes, sights and sensations will bring you back to this book again and again.